that tiny photographer: She is headed to camp. D'arcy is headed to camp tomorrow. When I was younger, we attended an Assemblies of God Church. I went to their kids and pre-teen camp several years in a row in Hartford City. We don't attend a church in that denomination but D'arcy's friend does. She invited D'arcy to come with her to camp. So she is headed to the same camp and camp ground that I went to as young person. She has been so excited to get ready. She's excited to use the suitcase. She was excited to use my little toiletry case. 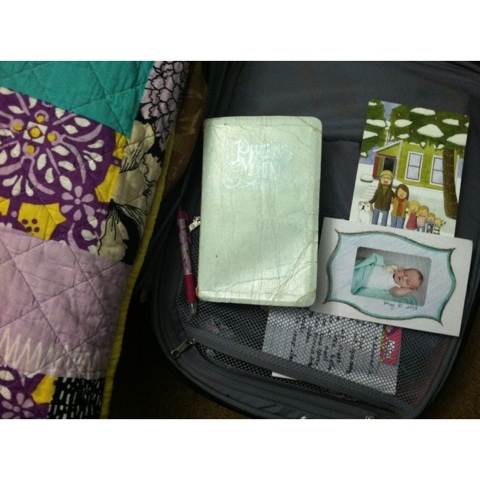 She took care in packing each item and preparing for her first week away from all the adults in her life. It's a moment of independence, a moment to be with her peers and have fun. I've never struggled to connect with my babies. I felt a deep, strong bond and love for them pretty immediately. As years go by, I've discovered that while that initial bond has created a solid foundation for our relationship, the relationship still requires work. That initial affection for your child can get lost in the midst of raising them. Behave this way. Focus. Work hard. No, you cannot do that. And for god sake, brush your hair! With five children, I have to be intentional about making time to adore each of them, especially my older ones. Especially my oldest. I read out the list of what to bring. She went to the bookshelf and grabbed a bible, notebook, and pen. She brought back the Precious Moments Bible that was mine as a child. The very one I took to Bible Camp. It reminded me of my similar excitement preparing for camp. She immediately asked if she could take one of our last Christmas cards and one of Penelope's birth announcements. She didn't want to forget us. My heart melted. I felt so connected to her. I felt so proud of her. I felt so thrilled for her to experience this little piece of life. I felt so grateful for this moment of emotion in a sea of parental admonitions. Make sure to shower every other day. Don't chase after boys. Don't feel pressured by the alter call, but listen to the Holy Spirit. And for god sake, brush your hair! I thought about all of the similar moments of excited preparation that await her, the night before she leaves for college, the night before her wedding. I'm hopeful that I will get to experience each of them with her. I look forward to the same sweet wave of affection that takes me back to the day I gave birth to her. Tears and laughter!! Such a real motherhood moment! !